I WAS DISAPPOINTED to see one glaring omission in the item about the 1969 bombing in Carnegie in the spring 2017 issue of PCM. While there were no injuries from the bomb at Scripps, that was, sadly, not true at Pomona. That bomb did not simply explode in the mailbox—it was picked up by a young secretary in the Government Department, and it exploded in her hand. According to the Los Angeles Times, she was Mary Ann Keatley, 20, wife of a CMC student. She had her “left eye ripped open and her right one penetrated by a fragment.” She also lost two fingers on her right hand. While the crime was never solved, there was considerable speculation at the time that the Vietnam War may not have been the motivation. Interested alums can use the research skills learned at Pomona to delve into newspaper archives for more information about the bombing and the turmoil on campus at the time. Both were heavily covered in Southern California, and the bombing made national news. Editor’s Note: Please keep in mind that the sidebar about the Carnegie bombing was a short excerpt from a much longer “Hidden Pomona” podcast. The full podcast covers these tragic facts in detail, and I highly recommend it for anyone interested in knowing more about that sad piece of Pomona history. MY GRANDMOTHER, Katharine B. Hume, was 1904 class secretary. I have letters and class (1904) snapshots of Winston Dickson, Pomona College’s first Black student, who was mentioned in “Hidden Pomona” in the spring 2017 issue of PCM. He founded a law firm in Houston, Texas, that still exists. He never got back to a class reunion—it was too far. IN THE SPRING 2017 issue of PCM, in the section titled “Fact or Myth,” I saw the picture of the Pomona College Glee Club and read the story about them winning the National Championship in St. Louis. This was a long-standing story in my family about my father’s participation in the Glee Club. (I believe he is the third person from the left in the front row of the picture.) His name was Richard G. Henderson, and he was in the Class of 1934. I never knew my father because he died when I was 1 year old. After graduating from Pomona in 1934, he went on to St. Louis University Medical School and graduated from there in 1938. During World War II, he was at the National Institutes of Health in Bethesda, Md, and was working on a vaccine for scrub typhus, a disease that the American troops were contracting in the Pacific theater. He, unfortunately, contracted the disease while working on the vaccine and died from the disease at the Naval Hospital in Bethesda in 1944. I have read PCM for many years and really appreciate the excellent quality and informative nature of the magazine. 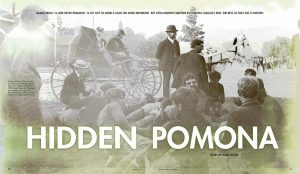 I ENJOYED READING about “Hidden Pomona” in the spring issue of PCM. The story of the Men’s Glee Club of 1932 in “Fact or Myth” brought back memories to share. 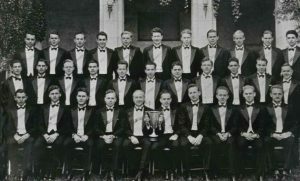 Several Glee Club members sent children to Pomona, including John Shelton ‘35, Louis Ronfeldt ’34, Leonard “Agee” Shelton ‘32 and Juan Matute ‘34. The tributes include John’s daughters Heidi ’61 and Lucy ’65 (a soprano), David Ronfeldt ’63, Agee’s children John ’63 and Jane ’65, and Juan’s children Juan Jr. ’63 and Gini ‘66. Agee was a bass and later a trustee. His son, John, was my close friend from grade school on. Agee told us of the story of the National Championship competition in St. Louis. The Glee Club sang Pomona’s original song “Torchbearers” to win the title, so “Torchbearers” is still the reigning national champion song. Moreover, the judges were impressed that the Pomona Glee Club did not have a director present and yet sang extremely well. Agee’s daughter, Jane Shelton Livingston, notes that while they were on the train to St. Louis, they sang and sang and sang to perfect their a cappella chops. She added that often-reigning Yale was the school to beat. Also, the Glee Club’s director, “Prof” Lyman, was the guiding force and beloved by all. It’s true he didn’t conduct the singers, but he certainly prepared them and inspired them. Two more things: First, the 1932 championship was the 17th annual event, not the first. It was the first time in St. Louis, and the prior 16 events were held in New York. Second, the runners-up were (not necessarily in order) Penn State and New York University. Yale is not included in the “Final Three” choruses in the excerpt. It does not tell us who was second and who was third. There is probably much more to the 1932 Glee Club story. I hope that additional people will write in. OUR FATHER, Juan Matute ’34, arrived at Pomona College a few years after he had come to Claremont from his birthplace in Guadalajara, Mexico. He had yet to master academic English. Imagine how thrilling it was for him to travel across the country with the Glee Club. It was an experience of his lifetime and one that he treasured throughout his life. We still have his scrapbook and the memorabilia he collected from the tour, including matchbooks, napkins and pictures. He was the first musical director for the Mexican Players of Padua Hills. He also played piano, guitarron and bass. He not only was the musical director but, as well, acted and produced many of the plays and musical concerts there. He met his wife, Manuela ’35, at Padua Hills, where she was a singer, dancer, actress and waitress. Manuela sang in the Women’s Glee Club at Pomona. When our father died in 1992, we played “Torchbearers” in honor of what Pomona College meant to him. IN “FACT OR MYTH” from the spring 2017 issue, the writer has added a new myth, that of the flightless sage grouse. While it has a chunky body and does not migrate, it is decidedly not flightless. It can fly up to 50 m.p.h on short local flights of up to five or six miles. As a bird photographer, I have watched their leks during mating displays many times, and I can personally debunk this one before it goes any further. THERE’S AN ARTICLE in the spring PCM about Cecil 3.0, where the writer mentions not knowing the origin of the first Cecil costume. I can help with that. The costume was made in the summer of 1980. Laura Stiteler ’82 was working in the athletics department and was assigned to (or maybe volunteered to) get a mascot costume for the fall. I’m sure the budget was generous: The head was very sturdy and professional-looking, and the rest of the costume was far superior to Cecil 2.0. It was a high-end costume, made at the time that the San Diego Chicken was a celebrity. Laura and I had gone to the same San Diego high school, where I’d been the mascot. So toward the end of my freshman year, she asked if I’d be Cecil. I said yes, and I was Cecil for the next three school years, until I graduated. Laura had ordered such a high-end costume that one part couldn’t take the kind of abuse I gave it. (I got beat up in it twice: once at a football game at Occidental, and once at a football game at CMC. Both times it was my fault; I provoked the other team’s fans.) The orange leather duck feet that it came with started falling apart, so Bob, the equipment manager in the gym, dyed some sweat socks orange and had somebody whip up some more resilient orange feet. I still have the original leather feet in a box somewhere. The photo (above) is from an ad for the old Coop Store, and the other people in it are Aditya Eachempati ’83 and Liora Szold Houtzager ’83. When I graduated, Dave Peattie ’84 took over being Cecil, and when he graduated, it passed to Allison Sekuler ’86. For the first year or two that I was Cecil, the dean of freshmen, Elizabeth Chadwick, called herself Cecily. She put out a newsletter authored by Cecily and had a pair of feathers, one blue and one white, that she kept in her office. When she left Pomona for her next job, she gave me the feathers and said now I’d be both Cecil and Cecily. So Cecil was both genders, or no gender, or something along those lines, way back in the 1980s. IN RESPONSE TO the short article in the spring PCM on the end of the marine zoology program 50 years ago, I took Marine Zoology and Ecology with Professor Willis Pequegnat the summer of ’51. (There was also an advanced course for pre-meds.) The boys slept on the roof under a big blue tent, but girls had to find accommodations in town, so not many girls took Marine Lab. I was lucky that my family home was in Corona del Mar, two blocks from the Marine Lab, and I even kept my summer job (cutting back on hours). Our textbooks were Animals Without Backbones and Between Pacific Tides. We had occasional field trips to local tidepools and a little outboard motorboat to travel in. It was a great experience! Why did it stop in ’67? PCM HAS ALWAYS been a good read—a welcoming and dreamy trip to my Pomona past—but also a reminder of Pomona’s vibrancy long after I scooted through the halls of Harwood. But it is wrenching trying to process the devastating news that one of my dear Pomona friends, Marylou Correia Sarkissian, was taken away from her children, family and friends in December. Any of us who crossed paths with Marylou knew we were spending time with a capital “E” extrovert. Back in 1985, I was a sophomore transfer and had a lot of introvert in my DNA. It was probably a good thing that Marylou was my Harwood neighbor. She drew me out and introduced me to her friends. 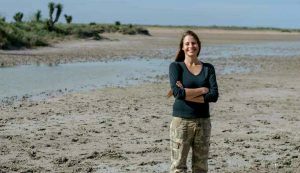 In a matter of weeks, I already felt like I had a home in the Sagehen roost. Marylou simply had that quality of making most anyone comfortable in her presence. She’d often come by my room to announce we were going “somewhere” in her white Chevette. A fast-food joint. The gym. Just a cruise down Foothill Boulevard. It didn’t really matter where. We had a great time hanging out and just chatting about life. Our last semester, Marylou and I both attended a job fair at a hotel near the Ontario airport. I wasn’t entirely sure of my next step post-Pomona, but Marylou was determined, focused and chock-full of résumés for the HR recruiters. I can’t be 100 percent sure—let’s call it 99 percent—but she left that job fair with more interviews lined up than any other attendee. Prestigious hospital and pharmaceutical firms. I can sadly admit, I was a touch jealous on our drive back to campus. It’s kind of crazy how certain people leave such an impression on your life. Friendships from those formative years bake into your memory. Then one evening, an awful piece of news, and all those memories come flooding back. We are reminded of the special people we knew, and how much pain their families are going through with their loved ones taken away. I wish Marylou’s children and family all of the possible strength they can muster. Words may not provide tremendous relief at this point in their lives. But they should know she touched a lot of lives in so many positive ways. Until we may meet again, dear friend. I HAVE LONG feared that the path of political correctness that Pomona College has chosen over these last several years would lead to a deterioration of my alma mater and the values it used to represent. The editorial titled “The Right Side of History” in the spring edition of PCM, which actually celebrates this decline, has confirmed my fear and provoked me to take pen in hand. In March of 2004, a CMC professor named Kerri Dunn told Claremont police that her car had been vandalized and spray-painted with racist and anti-Semitic slurs. The Claremont Colleges immediately erupted in self-righteous indignation and a frenzy of predictable PC actions, including canceling classes; organizing rallies, demonstrations and sit-ins; wearing black shirts; and chanting slogans of “pro-diversity, anti-hate.” When the facts came out, the Claremont Police Department and the FBI determined that Dunn had vandalized her own car and spray-painted the epithets herself, thereby creating a campus-wide hoax. A student reportedly said of the Dunn affair: “I’m not concerned whether it’s a hoax or not.” Really? Do facts and the historical record not matter anymore? Any historian who was trained, as I was, by mentors such as Vincent Learnihan, John Gleason, Jack Kemble and Margaret Gay Davies, would be horrified by such w anti-intellectual nonsense. Has Pomona College learned nothing since 2004? I believe that the proper definition of a college is “a community of scholars in search of the truth.” I have difficulty understanding exactly what Pomona College has become, but it is certainly no longer a community that includes me or any other like-minded alums who care about history. Editor Wood: You, sir, are actually on “The Wrong Side of History,” and you are taking my college down with you. IT WAS WITH interest and dismay that I read your column, “The Right Side of History,” in the spring 2017 issue of PCM. You note that “climate change is likely to top the list” of issues that “will seem so ethically obvious that people will wonder how on earth anyone could have gotten them wrong.” First, let me state my belief—and the belief of many others—that climate change is not settled science. The climate-change lobby has trampled on the scientific process in the myopic pursuit of its political and economic objectives and has shown little interest in contemplating the impact on its “research” of legitimate discrepancies in data and its mediocre adherence to the scientific process. The facts are far from conclusive, and the purported remedies even less so. The more important issue, however, is the event that occurred on the CMC campus on the evening of Thursday, April 6—the intimidation of, and attack on, scholar Heather Mac Donald of the Manhattan Institute. Is it not part of the mission statement of Pomona College that, “through close ties among a diverse group of faculty, staff and classmates, Pomona students are inspired to engage in the probing inquiry and creative learning that enable them to identify and address their intellectual passions”? That hardly seems to be the case any more, given the events of April 6 and the administration’s lack of response. I was unable to find any mention of the Mac Donald event on the College’s website, much less a forceful statement from President Oxtoby supporting Ms. Mac Donald’s rights, the students’ obligations to respect those rights and the College’s intention to punish the aggressors. So if ever there was a moment for the Pomona community to determine which side of history it wanted to be on, this would surely be it. My school. My beloved Pomona College. Why am I dumfounded, after our reunion two years ago featured confusing signs regarding who could or couldn’t use every public bathroom on campus, and where the alma mater is no longer allowed to be sung, nor a beautiful song that won our Glee Club a national championship long ago? Political correctness over “liberal arts” education (in the outdated definition of those words). Professor McIntyre, what has happened to your department and your school since you retired? Our culture is declining so fast, this kind of abuse of authority on campus is honored by school administrators almost everywhere, as is violent agitation against free speech by anyone not parroting liberal tenets. The only people allowed to be offended without reprisal are constitutionalists, who don’t carry billy clubs and fire sticks. I no longer contribute to the decline. Nor will I, while the mind-twisting continues. HMMM. MIGHT BE a gratuitous detail in the intro, p. 37, of the spring PCM that just arrived: ocelots in Uruguay? Hmmm. No more mention of this in the body of the fine article. But I live in Uruguay several months a year. Ocelots? Never heard of them there. Maybe my ignorance. I do vaguely remember an ocelot (I think) as the subject of a fascinating Kafka-like story by one of (neighboring) Argentina’s greatest 20th-century writers: Julio Cortázar. But in Uruguay? Hmmm. I WAS RECENTLY back at Pomona for my 25th reunion. It is hard to say why Pomona friendships remain resilient after so many years—because this was a formative time in our lives? Because of the particular people Pomona attracts? Was it the institution itself that molded relationships in a certain way? Or was it simply a surfeit of sun? It’s a strange and wonderful alchemy. I am grateful for all of your efforts with PCM. Whether I was in Myanmar or Laos (or Vietnam or India or Hong Kong before that), PCM has been a wonderful means of learning and staying connected. I always feel grateful for being part of the Pomona community after reading an issue. HERE’S ANOTHER STORY about the number 47. I will be going with my classmates to see the sun eclipse in August, and they have been kicking around the number 47 with a couple of professors from Pomona. What they have been talking about is far beyond me since my field was theology. For five and a half years, I did business for the United Methodist Church in 47 languages. I would leave Los Angeles on the first of November, flying west, and hopefully arrive back in Nashville, Tenn., for Christmas. It included large groups like Cantonese and Mandarin and small groups like the Kuki and Meitei tribes in Burma. Some interesting travels and stories. KEEP UP THE good work with PCM. You and your staff are doing an excellent job in my opinion. You have had a number of very good articles in recent issues. In the story “The Magical Bridge” in the spring 2017 PCM, the name of Olenka Villarreal’s husband should have been listed as “Robert” instead of “Richard.” Our apologies to the Villarreal family for this uncorrected error.